Autoimmune disorders can be frustrating for the affected lot as there is hardly any cure for them. In these disorders, an overactive immune system mistakes healthy cell in the body to be rogue ones and then attacks them. Lupus is one such disorder that tends to affect the women more than men. It leads to mild to severe inflammation, joint pain and in some cases organ damage. Lupus Treatment options are limited to reducing the pain and inflammation and controlling the symptoms. In recent times, the penchant for seeking alternative treatments for lupus has increased. The focus of any treatment for the disease is reducing the stress of coping with a chronic autoimmune disease for entire life. Stress management can make things better for the affected persons. In any case, self-medication is something you should refrain from doing. For better results, you can get in touch with groups of people living with the disorder in your area or through the Internet. People get afflicted with various types of ailments and some of them can be really difficult to cope with. The autoimmune diseases can be particularly tedious in this context. These diseases make the immune system of your body mistake healthy tissues as rogue ones and attack them. The most pathetic aspect of autoimmune disorders is that there is hardly any cure for them. Lupus also called Systemic Lupus Erythematosus is among such type of diseases that affect a lot of people worldwide. It affects women more than men. Lupus is defined as a chronic autoimmune disease and it causes the immune system in the human body to act hyperactive. It leads to inflammation and swelling of body parts. The disorder affects kidneys, Heart, skin, lungs and body joints. There is no cure for it as such, but Lupus treatment is focused on controlling and reducing symptoms, as is the case with most autoimmune disorders. Lupus makes your body’s immune system to fail to segregate healthy cells and antigens. The latter is capable of leading to a specific immune response. The most commonplace variant of lupus is Systemic Lupus Erythematosus, but there are other types like cutaneous lupus, neonatal lupus and drug-induced systemic lupus. The majority of people afflicted with lupus do not face major hassles but in some cases, the disorder can affect the life severely. No single specific cause of lupus has been identified. However, health experts believe the main cause is genetic structure in certain individuals that make them more vulnerable to such autoimmune disorders. Ethnic groups like Africans, Hawaiians, Hispanic and Pacific Island descents have more susceptibility to this autoimmune disease than others. However, a number of factors can act as triggers for this autoimmune disorder. To determine most apt Lupus treatment, determining the root cause may be necessary. These factors can also include hormones and Environmental elements like sunlight. Even emotional stress and injury can trigger its onset in some individuals. The Lupus symptoms include tiredness, swelling and joint pain. The severity of such symptoms can vary a lot from one affected person to another. The intensity may increase and decrease in the same victim with time. Since lupus manifests itself in different ways in the affected lot, there is no specific test for its diagnosis. However, in most instances the doctors go for blood and urine tests to confirm its presence. The doctor may also want to know about health history and related stuff. These will be helpful in deciding the course of Lupus treatment. Since Lupus is categorized as an autoimmune disorder, no cure for it exists. However, options to treat lupus have evolved over the years. As a matter of fact, the majority of Lupus treatment options focus on reducing the symptoms and pain. To treat skin rashes caused by the disorder, the doctors often recommend using Corticosteroid cream. Some Non-steroidal anti-inflammatory drugs can be given to control muscle pain and fever. At times, special medications may be given to slow down an overactive immune system in the body. The medications and treatments can at best reduce the pain and other symptoms. But the truth is, despite undergoing Lupus treatments you will have to live with the disorder all your life. This should not upset you as thousands of people continue to carry on with life after being diagnosed with this autoimmune disorder. Taking adequate rest can help you relieve the stress. This can help when you find the joint pain excessive. For a lot of lupus affected persons, sunlight is the biggest trigger. So, avoiding sunlight can be a good way to implement Lupus treatment. If you have to go out in the sun sometimes, resort to using sunscreen, hat and protective clothing. Using moderate exercises can be helpful to reduce joint pain and muscle cramps. Talking with a doctor can be helpful to find out if the symptoms are triggered by some specific food or beverage. Thereafter, you can discard such dishes from your meals to avoid the symptoms that are flaring up. Eating sea fish can be helpful, but alfalfa consumption aggravates inflammation. 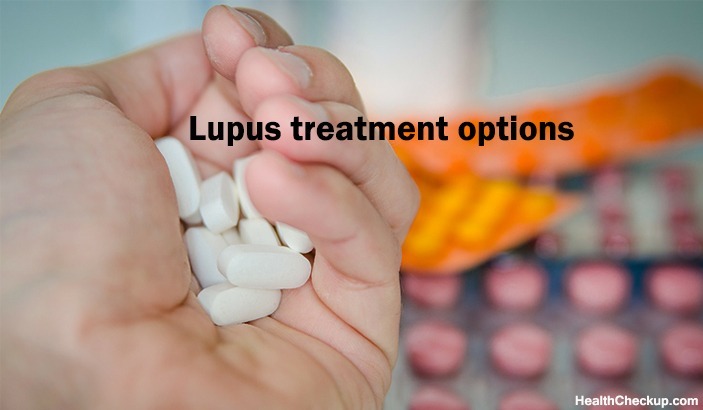 In recent years, a section of the lupus affected lot has resorted to using newer and alternative treatment options to cope with their conditions. There is no substantial body of research that can corroborate that using such alternative treatments brings long term relief. However, some victims have claimed benefits of using methods like chiropractic treatment, special diets, homeopathy and nutritional supplements. The main motto of any form of Lupus treatment is bringing down the stress of living with a chronic disorder. For managing the stress, some people also resort to meditation and yoga. The first thing you need to do after being diagnosed with Lupus is understanding the implications and learning the ways to live with the disorder. As a matter of fact, thousands of persons continue to live with the disorder and they figure out what type of Lupus treatment options are suitable. However, it is best not to indulge in self-medication and use drugs recommended by doctors to reduce the symptoms. Apart from medical intervention, interacting with people living with the disorder can be of help. Their tips and advice can help you cope with the symptoms. These can help you prevent major damage to body organs. The good thing is you can find such people and communities of Lupus victims online.